Formax Smart Carb is a richly fortified, high-quality pelleted grain concentrate designed for performance horses, mares, foals, underweight and older horses. Formulated to provide the energy and protein required to repair muscles, this product enhances endurance and promotes growth. Fortified with essential minerals and vitamins to support a strong skeletal system, stimulate the immune system and promote over-all health. Grain products, plant protein products, grain byproducts, roughage products, partially hydrogenated vegetable fat (preserved with mixed tocopherals), molasses products, calcium carbonate, monocalcium phosphate, dicalcium phosphate, salt, zinc sulfate, zinc proteinate, ferrous sulfate, iron proteinate, manganese sulfate, manganese proteinate, copper sulfate, copper proteinate, ethylenediamine dihydriodide, cobalt sulfate, menadione sodium bisulfite complex (source of vitamin K), choline chloride, calcium d-pantothenate, selenium yeast, brewer’s dried yeast, vitamin A supplement, vitamin D3 supplement, d-alpha tocopherol acetate (source of vitamin E) mineral oil, vitamin B12 supplement, riboflavin supplement, biotin supplement, pyridoxine hydrochloride, niacin supplement, folic acid, thiamine mononitrate, natural and artificial feed flavors. Foals and Weanlings: This feed is not recommended for nursing foals or weanlings up to 14 months of age. We recommend using Producer Horse H Textured or Horse Power Pellet, both 16% protein, for these horses. Yearlings and Two Year Olds: Feed at the rate of 0.75-1.50% of body weight per day. For most light horses this amounts to 8-12 lbs. per day. Adjust intake up or down depending on body condition, desired growth rate, forage quality and availability. Mares: Barren and early pregnant mares should consume 6-8 lbs. per day. If good quality forage is available, grain intake can be decreased. Late pregnant mares should be fed 7-10 lbs. per day plus liberal quantities of good quality forage. Lactating mares should be fed 8-12 lbs. per day in addition to forage. If grass hay and/or fescue pasture is being used for lactating mares, we recommend Producer 16% Horse H.
Performance Horses: Feed at the rate of 0.25-1.5% of body weight (8-14 lbs. per day for most breeds). Do not feed over 5 lbs. of grain at any one meal. Adjust feed intake according to work intensity, body condition, forage quality and availability. 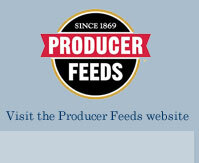 All Producer horse feeds should be fed with liberal quantities of good quality hay and/or pasture and free-choice salt. Provide fresh, clean water at all times.